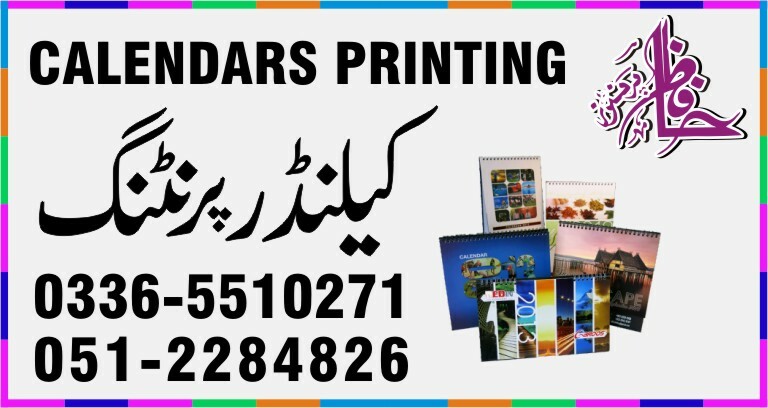 We Provide Calendars Printing Services in Islamabad, Pakistan. Very High Quality Calendars Printing Services In Low Prices. Calendar printing play important role in current market with your business products and services details, image etc.. We offer three calendars types for business marketing needs for all the years round: Wall Calendars, Poster Calendars and Card Calendars. You may be familiar with wall calendars as they are the kind used by most; they display one month at a time. Wall Calendars are made of multiple pages bound together using wire-o or saddle stitch binding. They usually have a photo or image above the calendar days to increase its appeal. Card calendars and poster calendars display an entire year on a single sheet of paper or cardstock. We offer them in standard postcard and poster size, respectively. Luxury calendar with special paper, embossing, multi colors printing, foiling, spot UV etc..